Change the World…One Smile at a Time! I know how fortunate I am. I have two smart, thoughtful, talented, beautiful children and when they smile–which is very often–they light up a room! Unfortunately, for many children around the world a smile isn’t a common occurrence. Those born with a cleft lip (a split in the skin of the upper lip) and/or a cleft palate (an opening in the roof of the mouth) can’t thrive because they might have great difficulty eating, speaking and often suffer social challenges as well. Luckily, there are people who care. This Fall, top-ranked New York City Facial Plastic and Reconstructive Surgeon, Andrew Jacono, M.D, F.A.C.S., will lead a group of facial plastic surgeons working with HEALING THE CHILDREN NORTHEAST for a mission to Santa Marta, Colombia to perform surgeries on children with cleft lip and palate deformities, as well as microtia, a congenital condition in which a baby is born without one or both external ears or with an ear deformity. They’ll screen and operate on numerous children giving them new faces and smiles. You can make a difference! Every dollar counts. To donate, please click here. Dr. Jacono is committed to helping those who don’t have the medical or financial resources to correct their facial deformities. He performs pro-bono surgery on victims of birth defects, domestic violence, traumatic events, war and cancer. For more information on Dr. Jacono’s philanthropy and charitable works, click here. If you’re one of the lucky ones you get the opportunity to grow old. And if you’re one of the wise ones you choose to grow old gracefully. I find that growing old gracefully has everything to do with attitude and very little to do with looks. It’s about embracing life and living it to the fullest no matter where you are number-wise. Growing older is one thing, looking it is another thing altogether! Eat healthy. Fill up on antioxidant and nutrient rich fruits, vegetables, nuts and seeds. Stay active. Experts recommend a few hours of aerobic exercise and 2-3 days of strength training weekly. Treat topically. Anti-aging topical treatments like Alpha and Beta Hydroxy Acids (AHA & BHA) can lessen fine lines, Vitamin A derivatives (tretinoin and retinol) will help build collagen and thicken the skin, Vitamin C will improve skin tone and texture and Vitamin E moisturizes and heals. Protect daily with sunscreen. Look at the ingredient list and choose a product containing zinc oxide or titanium dioxide to make sure you’re getting broad spectrum protection from both the UVA and UVB rays. There’s also much that can be done in a doctor’s office. 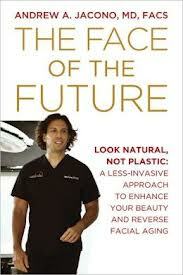 To educate yourself on the latest anti-aging options available I highly recommend The Face of the Future, Look Natural, Not Plastic: A Less-Invasive Approach to Enhance Your Beauty And Reverse Facial Aging, by Andrew A. Jacono, MD, FACS, an interesting and informative read on the latest facial rejuvenating procedures, from non-invasive to surgical treatments. This book demystifies topical treatments, peels, injectables, lasers, energy-based tightening treatments, face-lifts and numerous other procedures. You’ll also find how to get the most from your skin care regimen, advice on choosing a doctor, what does and doesn’t work, before and after photos and so much more. For more info. on Dr. Jacono, click here.